A home cooking blog from my little kitchen in Paris. An experience of diverse recipes and various cuisines. Lebanese cuisine is a very healthy cuisine and cooking depends on the freshest ingredients. It's healthy for its use of legumes (garbanzos and lentils), grains (bulgur and rice), lemon, olive oil, pomegranate, herbs (parsley and mint) and spices (sumac, cinnamon, cumin...) When thinking about Lebanese food, it's the fresh fruits and vegetables that come to mind. The use of fresh, seasonal vegetables plays an important role in Lebanese cuisine; some of the most prominent include eggplant, bell pepper, cucumber, tomato, zucchini, and spinach. 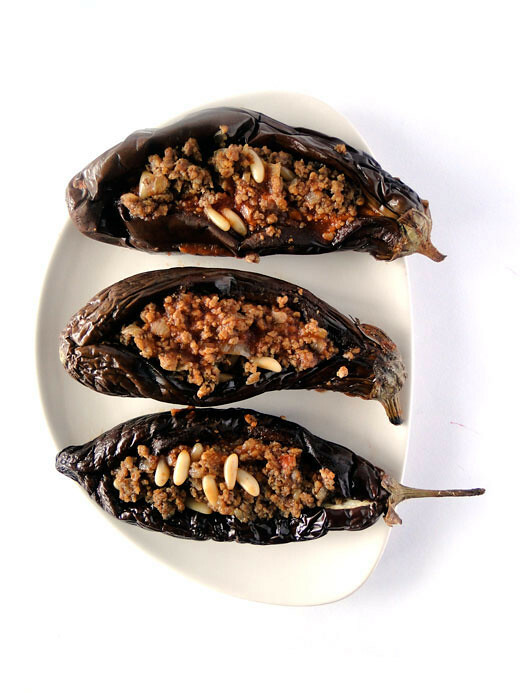 Today's dish is called Sheikh el Mehshi which consists of small eggplants stuffed with meat and onions and served with rice. There are two ways to make this dish, some people fry the eggplants and others like me, choose the healthy method and just bake it. I always serve this dish with basmati rice, but you can also serve it with plain yogurt too. 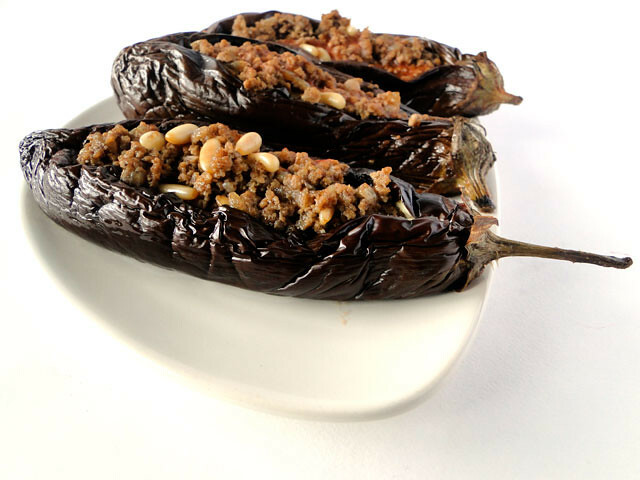 Place the eggplants on a baking tray in a preheated oven at 450ºF (230ºC) for about 1 hr. Rotate every 15 minutes for even cooking. Meanwhile, heat the olive oil in a skillet over medium-high heat, and saute the onion until tender. Add the meat, and cook, breaking it into small pieces. Season with salt and spices. Mix in the toasted pine nuts, and remove from heat. Set aside. Once the eggplants baked. Remove from oven and let them cool. Make an opening along the eggplant and spoon the meat filling. Measure one cup of water and mix in the tomato paste and pomegranate molasses. Season. Place the eggplants in a baking dish, and carefully spoon the tomato mixture over the eggplants. Cover the dish with aluminum foil and bake in the oven at 180ºC for about 20 mn. Serve with rice or plain yogurt. Disposez les aubergines sur une plaque à four et enfournez à 230ºC environ 1 hr. Tournez les aubergines toutes les 15 mn pour une cuisson parfaite. Pendant ce temps, faites chauffer l'huile d'olive dans une grande poêle, et faites revenir les oignons jusqu'à ce qu'ils soient tendres. Ajoutez la viande et laissez cuire. Assaisonnez de sel et d'épices. Ajoutez les pignons de pin. Réservez. Une fois les aubergines cuites. Faites les sortir du four. Faites une incision dans le sens de la longeur et ajoutez la farce. Mélangez le concentré de tomate avec l'eau, la mélasse de grenade puis assaisonnez. Disposez les aubergines farcies dans un plat allant au four, et versez doucement la sauce tomate dessus. Couvrez avec du papier aluminium et enfournez à 180ºC pendant 20 mn. Servez avec du riz ou avec un yaourt nature. Yuuuumy! Those eggplants look fantastic! A beautiful summer dish! I love the spices in the meat filling. This sounds so yummy! 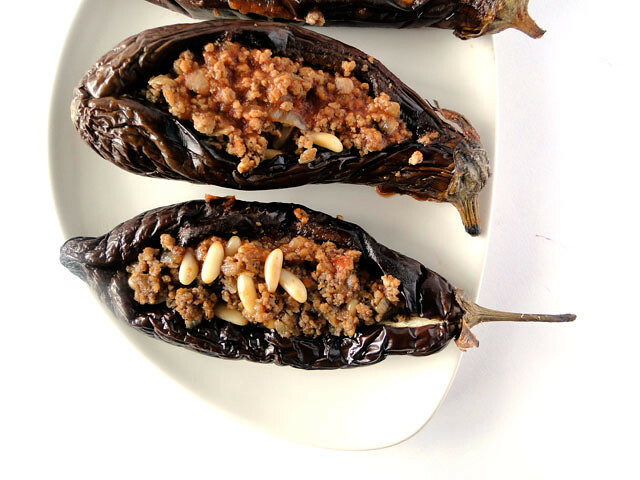 Eggplant, pine nuts, and a great use of spices for the meat...I need to see no more--this is a must-try. Looks like the kind of dish that makes you feel wonderful after eating. This is such a creative use of eggplant. I love that combination of ground meat, spices and pine nuts. I love the pine nuts in the stuffing! Sounds incredible! And the photo is gorgeous! I love middle eastern food and your pictures are beautiful. I grew up eating stuffed eggplants but I've never made them myself. I'm growing my own eggplants for the first time this year and I think I'll try this recipe. Just drop in and found a delicious world friend! This eggplants with delicious filling look too yummy! qu'elles sont belles tes aubergines farcies!!! I would love to try this, it looks absolutely delicious, but I'm wondering if you can suggest a more common substitution for the pomegranate molasses? Susan, if you don't have pomegranate molasses you can skip it. WOW!! I have to give this a try. Every time I see this recipe I drool but have never made them yet. The flavors are fantastic and the best combination of taste and texture so typical of mediterranean food! I am in love with your sesame rings too. So beautifully done. don't know if i will get the ground cherry pits. this must add some nice unusual flavor. I might start saving our cherry pits? I'm amazed at how many wonderful dishes you can make with eggplant. I never knew it could be so diverse. You are a true inspiration! They look amazing! I really need to try eating more eggplant. J'adore tes photos qui sont superbes, du vrai travail de professionnelle; le sheikh al mehshe est un de mes plats traditionnel favori. I love this, so many similarites with out two cuisines. Our dish is called "papoutsakia" or "little shoes" and they are also topped with a bechamel sauce and baked until golden. These stuffed eggplants look scrumptious. Never had it before.. Sounds wonderful! I ate eggplant almost daily in Greece but I'll never tire of it! En france ce n'est pas facile à trouver ! To die for....I could eat this everyday...oh wait...there is so much more yummy food! Thank you for posting all those Lebanes/Middle Eastern recipes in English. Thanks for telling about these services of limo providing by your company. I also like to take part in the competition. Hello, my name is Cherine, but you can call me "Chicho" :) I am Lebanese and I live in Paris. Welcome to my internet kitchen, grab a cup of coffee, a macaron and get comfy! This blog is my recipe journal. It's where I write about the recipes that intersect my everyday life. Often the recipes are from my cookbook collection, my magazines, my favorite blogs... sometimes not, they might come from my mother, a friend, a neighbour... or I might write about a recipe I invented myself.